One of the biggest things in making sales is, of course, for shoppers to find your eBay listings. Back in the early days, eBay was just about the only game in town & it seemed if we listed it, it was bought. eBay & the internet have matured, as online shoppers have become more savvy. It's up to us sellers to do the same! The basics still come into play; keyword-rich titles, descriptions, store header descriptions, great photos and great feedback ratings. With Cassini now being eBay's search engine, many other factors such as the buyers' behaviors and the sellers' trust factor come into account in search results. Yep, eBay has restrained us to various degrees, but for us sellers who want to make a part- or full-time income through eBay, opportunities still abound. Fill your 80-character title with every possible search word shoppers may use! eBay suggests titles should include 4-5 great keywords. Those words should appear towards the beginning of your title to benefit on google searches. Forget good grammar in your title; for example, if you're selling a lovely Tiffany 14 karat yellow gold ring with a round 2 caret deep-blue sapphire and a small cherub next to that luscious gem, "Lovely 14 kt Gold Ring with 2 ct Sapp and Cute Cherub" does have a couple decent keywords, but no one searches on "lovely", "with", "cute" or "and" and few will search on the abbreviation "sapp". "Tiffany 14k Yellow Gold Ring 2 ct. Sapphire Cherub" is packed with the words shoppers will use. Use eBay Research Lab's keyword tool at http://labs.ebay.com/Catman to find the top keywords for your category; there will likely be some you should use. Another method for figuring out titles is to use ebay's own search bar into which shoppers put their terms; in the search field at the top of eBay pages, put in a word or two that you think most closely identifies your item. 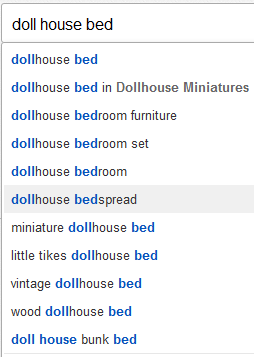 For example, if I wanted to find a bed for that doll house Im making, Id put doll house bed into the search field. A drop down of common search terms shoppers have used appears below the field. Right off the bat, I see dollhouse as one, not two, word. The image to the right shows what appears. Though I hadnt thought of it, I want one made of wood, so Ill click on wood dollhouse bed on the list to see the results which are most relevant to me. Whats really important is that if I had a wood dollhouse bed for sale, Id see that wood dollhouse bed is the exact phrase shoppers are using, so those would be the first three words I have in my title. Check your traffic reports in your eBay store; you'll discover what words shoppers are using to find things in your store and may be moved to revise your usual titles based on that information. Not selling jewelry? Fine! Check completed listings that SOLD and take a clue from your competitors who made the sales as to the types of keywords to use in your titles. Think of Item Specifics as being as valuable as your title; If someone were to search for dollhouse bed canopy 1:12, if I have Scale as one of my Item Specifics and it is 1:12, my item is going to show up in the search results even if that isn't part of my title. eBay has default item specifics for most categories. If you have a feature thats important to identifying your item, add a custom Item Specific about it! Heck, add 5 Item Specifics if needed! For example, on this dollhouse bed, I may want to add these Item Specifics with these values: Measurements: 6? tall, 6 ½ long, 4? wide; Mattress: 4? x 6? x ¼; Canopy: blue, lavender and olive green floral pattern; Bedspread: blue, lavender and olive green floral pattern, 7? x 8? ; Manufacturer: Hand-made; Materials: Mahogany-stained and varnished wood, cotton batting, silk fabric. Shoppers find your eBay store often through Google and other search engines. Even those who weren't planning on shopping may find your eBay store through search engines. How??? Your store description (shows up in your store header) should be full of keywords; your product types, brands and store categories. Many sellers write a "welcome, come back soon" sort of message in that area. Sure, it's a nice thing, but the best use of that section is keyword-packing! Imagine someone googling the history of your area of expertise or looking for further info about the types of products you sell. Do you have one or more custom store pages to provide such? If not, create 'em! eBay pages are found by search engines and if you have valuable content, it will be found by potential customers. Teaching others and positioning yourself as an expert can be done by publishing your custom store pages. Store category names are also search engine optimization fodder; are your store categories descriptive? If you sell coins, for example, are your store categories US Coins, Canadian Coins and other? Or do you break the categories down into US Coins with sub-categories of dollars, halves and quarters and further sub-categories of early, seated liberty, trade, morgan, peace, and so on? Use your store categories to be found by search engines - and, of course, to make the shopping experience friendly. Your Store Name is another way to be found. Rather than a generic name, if you sell a particular line, naming your store with that line is a good thing. "Brand Name Power Tools" is more likely to be found than "My Shop Stuff", for example. Please note that the new store design (with the banner image at the top) has far fewer SEO features than does the classic eBay store layout! While your total item and shipping cost being lower than the total cost for the same item is important to Best Match search ranking, eBay gives a higher standing to items with free shipping. When you do offer free shipping, do offer additional shipping options for a fee. For example, if you list a pair of sunglasses with free shipping via USPS First Class, you should also offer Priority Mail at $7 (or whatever rate seems fair to you) and overnight shipping at its appropriate cost. Buyers like options and many will often choose a faster option when available even if they have to pay extra - and that free shipping you've offered has helped in your listing being found! Be a Top Rated Seller! Granted, there are requirements to make a certain number of sales over a period of time to become a PowerSeller, which is the first step to becoming Top Rated, but even many part-time sellers have the volume to be Top Rated. This rating often puts your listing ahead of the listing of the not-top-rated seller's listing. To see the requirements and benefits of being a Top Rated Seller, see pages.eBay.com/help/sell/top-rated.html. Your selling performance should be Above standard to add weight to your listings being found through Best Match. Free shipping, in some categories, may boost your Best Match ranking. Use item specifics and catalog details to provide the most information about your product you can and - you guessed it - to be found better thru Best Match. Click-through rate and sales over impressions! When shoppers click your title from a search results page and, especially when they buy and the ratio of sales to hits is strong, your Best Match ranking rises. Title relevancy. Those above hints about creating great titles are important; the closer they are to the search terms shoppers are using, the better your chances of being higher on the Best Match! Ending times? Sure, a little bit of this comes into play in Best Match. This has to do mostly with auction items and a little to do with fixed price. Spreading out the ending times of your listings so that they get a nudge during the final hours of their listing will aid in your listings being higer in the results over a period of time. ALWAYS!!! use the item condition field when listing. Leave off the item's condition and you'll find your listing way down in the results. Many shoppers are more savvy than just searching on a keyword to find what they're seeking; they'll drill down based on the categories and item specifics info, so you'd do well to include all that info! If you add the word "new" to your title, for example, but do not have "new" as an item specific or condition, when a shopper filters the search results to look for new items in the category they're searching, that "new" in the title doesn't help your item being found unless the shopper searched for the keyword "new". The ending time of your fixed price listing has little affect on its ranking in searches. However, auction listings which are ending soon do have a higher visibility possibility. When you do a search on eBay using the default, Best Match, auction items ending within the next hour appear often in the top results. If you list items on auction primarily and those items tend to be related, I recommend spreading out your ending times so that you'll be able to take advantage of this. Many listing programs, such as Blackthorne Pro, allow you to schedule the starting (thus ending) times of your listings at no additional charge. You can also schedule listings through eBay at an additional 10¢ each. Being a Top-Rated Seller helps much in the ranking of your listings. See the requirements here for becoming top-rated. The benefit most sellers like about being a TRS is the 20% discount on your eBay fees! Your feedback rating is not nearly as important as are your DSRs (Detailed Seller Ratings - the stars) - you'll see TRSs with 100 feedback and those with 1 million. The more sales you have on a particular listing, especially when compared to how often your listing is found in searches and how often shoppers visit that listing, the greater opportunity that listing has to rank higher in Best Match searches. With the elimination of duplicate listings, eBay has done sellers a good deed, not only by getting rid of repeated listings in searches, but by encouraging sellers to list multiple quantities of the same item within one listing. When you use multiple variations on a listing (such as dozens of t-shirts in different colors and sizes), the sale of each variation adds to the total number of sales for that listing. When you relist that fixed-price listing, its previous sales is an advantage to its ranking in Best Match searches. When you have multiple quantities for sale in a particular listing (such as 100 of the same DVD), each sale from that listing helps its ranking. The more recent sales you have on a fixed price listing also affects its Best Match ranking. The conversion rate of sales to views plays a big part in a listing's ranking. It's better, of course, to sell 2 items out of a quantity of 10, than 20 out of 200 - 20% vs 10%. That thumbnail photo which appears when a shopper searches for an item? How clear is it? Does it show just what you're selling? Does it make shoppers want to click on your listing? Once the shopper clicks on your listing, do you have decent photos which really show off your item? You should have, for most items, a photo of the overall item, a photo of details, a photo of damage, of hallmarks. Selling something you have on hand? Take a photo of it, don't use the stock image! Granted, if you're selling new DVDs or books, then the stock image will suffice. But if you're selling a DVD that's slightly used or darned near anything else, take a photo & use it!!! That title bar image which shows near the top left of the listing page has an Enlarge feature by default so shoppers can see that photo enlarged. It's quite frustrating to click that Enlarge link and discover the resulting photo is no larger than the title bar image. Provide a photo that's 1000 or even 1600 pixels wide! It is believed by some (though not confirmed by eBay) that the more photos you have in your listing, the more that helps your Best Match ranking. If that belief is erroneous, at least your shoppers will benefit by having many views of your item. Many shy away from using a sub-title due to the fees, but some are wasting their 50¢ or $1.50 on each listing which has a subtitle such as "Free Shipping" or "Another great deal from So & So"! If you offer free shipping, there's already a column with that noted. And who really cares about "another great deal"? Your sub-titles should encourage browsers to click to your listing by providing information which will excite them to do so. An old eBay selling axiom is "write your description as if you have no photos". Follow this! Imagine all the information your shoppers will want to know to make an informed purchase from you; brand, measurements, detailed condition info, era it was made, colors, etc. If you tend to get asked questions about your items, you're not providing all the shoppers want to know! Use paragraphs (left-justified, NEVER centered). Use bullet points to list pertinent info. Use proper spelling and grammar. Mention the item specifics in your description. Mention your payment, shipping, combined shipping and return policies. Speak to that one shopper. Have a conversation. Let "you" show through. Shoppers demand a professional experience, but when you go the extra step and show you're a real person, that captures the shopper's attention. Shoppers don't generally want to wait several days until an auction ends to purchase something. If you're pretty sure the items will sell at a particular price, add a Buy It Now option to your auction or list it at a fixed price. Once a shopper clicks into your listing, if he's interested in dickering, the Best Offer option may encourage him to make an offer. You can set your listing to automatically deny amounts under a certain level or to automatically accept amounts over a particular level. Informing shoppers that you offer a combined shipping discount on multiple purchases is generally expected and may very well get them to see what else you have they may want in order to save a few bucks. eBay listings and stores show up well on Google and other search engines. Custom eBay store pages helps SEO very much according to what the Top Seller Account Managers I work with tell me! Detailed product line information - If you sell products which you can explain in depth beyond what's in your listing descriptions, put those details out there. For example, if you sell beeswax candles, writing about and showing photos about the history of such candles, how they're made and how to choose the best for the buck is worth the space of a custom store page. If someone Googles "beeswax candles history", your custom eBay store page will be found - probably not on the first page of results, but over time, it will rise in the Google results. Seller Favorites - Do you sell a line of products that include items for those with varied levels of expertise in their use? For example, you may sell power tools for the beginner, casual and professional users. Provide info on what's best for each type of user. I expect, in this circumstance, young or newly-single women may be seeking info on "how to choose a power drill" for household projects. Deal of the Day (or Week or...) - A custom page like this means you'll have to update often, but by linking to your Deal page from your listings, in your email signature, on Facebook, etc., that page can draw regular traffic to your listings. Jst becuz yew kahn reed tihs dussent meen ya shuld mizpel wurds en yur tiltes and decstripshuns! Most won't notice explicitly if your spelling and grammar are correct, but you can bet when someone reads something like "This is up for sell you won't loose by buying from me", the impression of your professionalism will suffer as will your sales! The above information will help your eBay store and listings be found and noticed - important facets towards growth. Want to list more and sell more but you're already squeezing every minute out of the week as you can? What listing or eBay management software are you using? What automation features are you taking advantage of? How are you (or are you even?) organizing your work tasks? ORGANIZE! If you are writing up all the details of your item, taking its photos, entering its listing onto eBay or your listing software and then going onto the next item, you're likely not working in as organized a manner as you could be. Think Henry Ford and that assembly line: Line up your items, measure and write up your descriptions. Take all of your photos. Then size/optimize all of your photos as needed. Then enter your descriptions into your listing program. Then pack the items you have to ship today. Then, put those packages on the porch for your postal carrier to pick up. And so on. Batching tasks has proven time and again to be more time-efficient than doing one thing at a time. LISTING & eBay MANAGEMENT SOFTWARE! Still listing directly on eBay through the SYI (Sell Your Item) form? Why??? Okay, a few sellers "sell similar" and make the needed changes pretty quickly, but darned near every eBay seller can benefit from a listing tool! As mentioned in the above paragraph, you can enter all of your descriptions, titles, etc. in one batch. Some of the tools let you apply a template or listing frame to your listings with the click of a button. Some of the software, such as SixBit, allow you to revise item records and listings in bulk, to leave feedback, to interact with your postage program, to send emails to customers and more. All of these features in listing or eBay management programs WILL save you time! Evaluate your own needs, then ask your fellow sellers for recommendations on software that meets your needs or visit the web pages of eBay's own and third-party tools. AUTOMATION! Some of the above-mentioned listing and eBay management programs have features to automate eBay-related tasks. Some require a couple button clicks, so are semi-automatic. Selling Manager allows you to leave positive feedback automatically when a buyer leaves you the same and also can automate the relisting process. EMPLOYEES! Granted, some of us just don't do enough business on eBay to justify the expense of an employee. But some of us do have enough business to hire one or more employees - and some of us do enough business on occasion to justify the infrequent expense of an assistant. Have kids? Tie their allowance into doing inventory or packaging items. Have a neighbor who likes to get out of her house every once in a while? Hire her to take photos for you - or even do your dishes so you can do the work of your business. Need someone on a more regular part- or full-time basis? Ask your fellow local sellers and neighbors if they know anyone who knows eBay and is seeking work. Hire that college photography student to shoot and optimize your photos. Find that retired man who used to work at the local antique store to help you write descriptions. Employees, even on an infrequent basis, can do much to help us manage our own time. Certainly, many long-timers realized they had to keep up with the marketplace and do those things so many newer sellers do. When did you last check out eBay's advice for sellers? Click on the Seller Information Center link at the top right of most eBay pages and read up! Don't pass by the info under "Getting Started"! We DON'T know it all and "Getting Started" is a good place to review some of the basics about selling on eBay. Then - go onto all the info under "Growth Strategies"! Unless you've been a fanatic about reading all of eBay's help pages, announcements and discussion boards, chances are huge that you'll discover some tips and tricks to help you build your eBay business. eBay's discussion boards are a great resource - if you can deal with wading through the many posts by trolls and complainers. I've found the Building an eBay Business board holds a wealth of excellent information with few distractions. The eBay Stores board is another very good one, though I see a lot of whining there. You can find the link to the list of discussion forums under the Community tab at the top right of most eBay pages. Keep an eye on your Traffic Reports. If you have an eBay store, sign up for the Traffic (and Sales) reports so you can figure out what's working and what's not. Learn which of your eBay pages and listings are most popular. Discover the keywords and phrases most commonly searched upon in your store. Find out which days you get the most visitors. AND keep track of this information so you can use it over time. Use Google's Adwords Keyword Tool to find out the terms shoppers are using to find your products. There's a very good video on youtube which explains this in depth - it's an excellent tool! Squidoo.com ranks at number 80 (as of 6/29/12)in popularity according to Ranking.com - that's quite a coup when you consider there are millions upon millions of websites on the web. (eBay's #13) Squidoo is all about content - darned near any topic you can imagine has been written up in a Squidoo "lens". Your Squidoo lens can be as simple as a paragraph with a link to your eBay store or website or as comprehensive as an e-book with much text and photos and links to related products (can even be your own eBay listings!) which readers can click on to buy - and you'll make a commission. Consider duplicating your custom eBay store pages' content onto a Squidoo lens - the more you get "out there", the more shoppers will find you! How much time do you, your friends and family spend on Facebook? Are you promoting your eBay listings there? eBay has several applications which can be used to promote your listings. Having a successful eBay business (or pretty much any type of business!) requires you not only work IN the business (listing, shipping, emailing), but ON the business (marketing, tracking)!